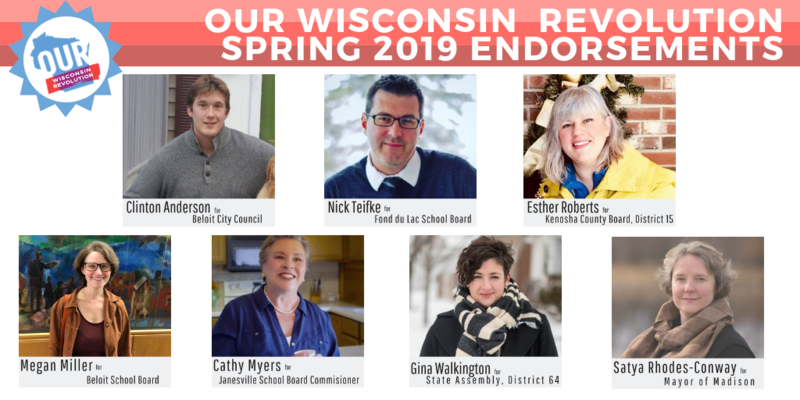 04/01/2019 – Find out what Our Wisconsin Revolution members and their chapters have been up to this last month and remember to VOTE tomorrow, April 2nd, in the Spring Election. Traditionally, local elections like tomorrow’s spring election are not paramount among voters. These elections don’t have the glitz and glam of a presidential or mid-term election, but never the less; these elections are arguably the most important in our communities. The parents, teachers, farmers and social workers who run for local office are not voted in with the Electoral College, they rely on their community to support their campaigns and turnout at the polls on election day. In spring elections, races are regularly won or lost by just a few votes. From School Board to County Board to City Council these offices directly impact the places we live. They manage our public schools, local roads, property taxes, garbage routes, snow cleanup and many other facets that contribute to the success of our cities and towns. These offices shouldn’t be taken for granted or forgotten. 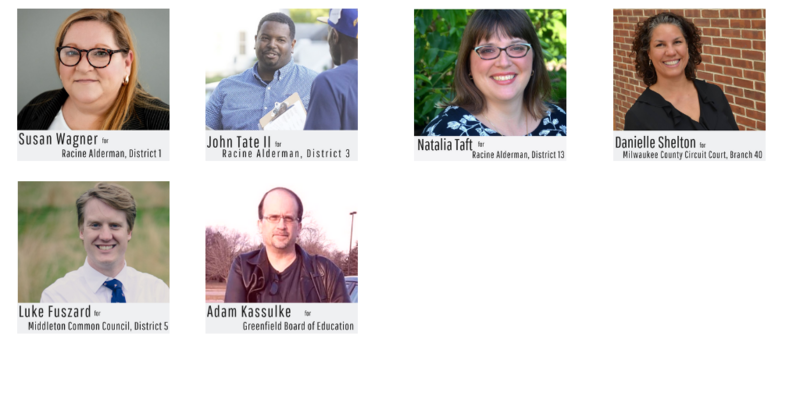 This election, Our Wisconsin Revolution has endorsed 13 candidates that vow to put the people in their community above greed and private profit. These local candidates are devoted to the constituents they will serve and are ready to make grassroots change in their hometowns. So please, Vote with Our Wisconsin Revolution in April 2nd. In addition to our 13 locally endorsed candidates, Our Wisconsin Revolution is asking our members to support Judge Lisa Neubauer in her race for Wisconsin Supreme Court. Currently, conservatives hold a 4-3 edge on the Wisconsin Supreme Court and they consistently vote in the interests of corporations and billionaires over the will of Wisconsinites. One of the three liberal justices is retiring, and we can’t let another conservative take her place further unbalancing our Court. 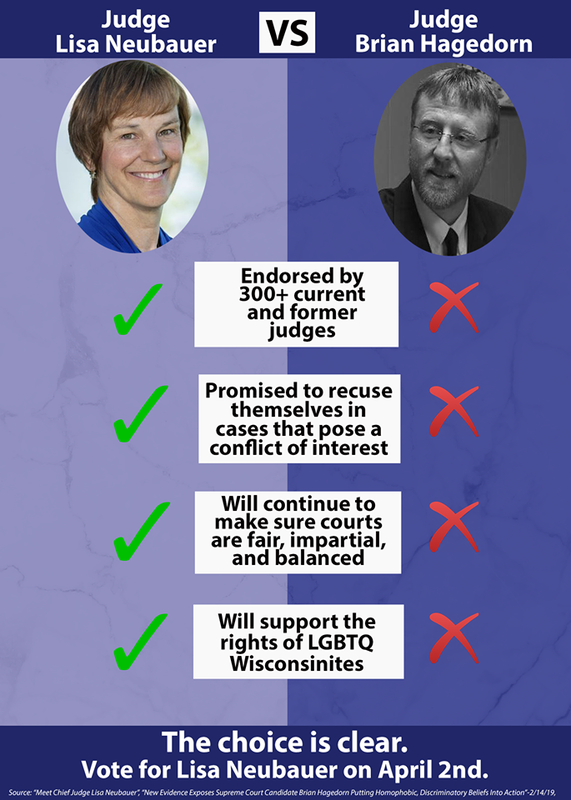 While Neubauer has the endorsement of over 300 judges in the state of WI, her homophobic opponent has big money. Turnout will be the deciding factor in every race on the ballot, so if you haven’t voted early – make sure you head to the polls tomorrow, April 2nd, to vote! 1) If you see anyone having issues voting at the polls, whether it is due to lack of documentation or other barriers – report it to the Election Protection Hotline: 866-OUR-VOTE. This helpline is administered by the Lawyers’ Committee for Civil Rights Under Law. Please feel free to share this number as well. 2) If you get turned away at the polls, you can always ask for a provisional ballot. 3) View a sample ballot, so you know who and what you are voting for ahead of time. Myvote.wi.gov is a fantastic resource to find your polling place, check registration or view a sample ballot. Use this website as an all-purpose voting tool! 4) In the state of Wisconsin, you can register the same day that you vote (with proof of residency and a valid ID)! NO EXCUSES. Make a plan to vote. Talk to a friend or neighbor and go together – keep each other accountable and cast your ballot on election day! “What’s the deal with the Green New Deal? It is the hottest topic in Washington, garnering enthusiastic support and bombastic dismissal. It calls for sweeping action in response to our climate crisis, through a radical transformation of our society and economy. It harmonizes well with Our Wisconsin Revolution’s commitment to social justice and environmental responsibility through grassroots democracy. ORGANIZING 101 and ACTION TRAININGS: As always, Our Wisconsin Revolution has access to over 2 hours of Action Network training and multiple organizing trainings available to Our Wisconsin Revolution members. Check out all of the available courtesy of Our Revolution National HERE. BUDGET TESTIMONY STORY COACHING: Dan Grandone, creator of WiLD (Wisconsin Leadership Development Project), will be offering 3 FREE online opportunities to receive help crafting and coaching folks on their “story” to provide budget testimony. These will be 90min video calls where a majority of the time will be spent in online small groups with an experienced coach. You can choose to sign-up for 1 or all 3 of the sessions. Dates and times: April 3, April 10 and April 23 @ 7:00-8:30pm. Register and receive your link for the call: http://bit.ly/WiLDStoryCoaching— This is a great opportunity for those who missed the Budget Action Workshops or those who attended the workshops but want some coaching! Be prepared to give, and get coaching on, your 2-minute testimony on the call! 04/05 – Janesville Joint Finance Committee Public Hearing for the 2019-2021 state budget. Attend and give testimony to the JFC, let them know how you’d like our state budget to be spent. 04/10 – Oak Creek Joint Finance Committee Public Hearing for the 2019-2021 state budget. If you live in the Milwaukee Area, attend the Wisconsin State Budget Hearing and make your voice heard. More info HERE. 04/10 – Dan Kaufman: The Fall of Wisconsin: The Legacy of Divide-and-Conquer Politics. Join the UWM Center for 21st Century Studies for a talk by journalist and author Dan Kaufman. 04/13 – The Third Annual Tax March (Milwaukee). In April 2017, people gathered in over 180 cities to demand Donald Trump release his tax returns after promising repeatedly to do so. The tax march continues. In 2019, we will gather again and continue to hold our elected officials accountable. 04/15 – River Falls Joint Finance Committee Public Hearing for the 2019-2021 state budget. Attend and give testimony to the JFC, let them know how you’d like our state budget to be spent. 04/24 – Green Bay Joint Finance Committee Public Hearing for the 2019-2021 state budget. Attend and give testimony to the JFC, let them know how you’d like our state budget to be spent. 04/24 – OWR- Eau Claire re-launches and hosts their first monthly meeting at the Eau Claire Public Library from 6 pm to 7:30 pm! More information HERE! 04/28 – Workers Memorial Day. Every year on April 28th, the unions of the AFL-CIO observe Workers Memorial Day to remember those who have been injured and killed on the job and to renew our efforts for safe workplaces. 03/04 – Advocate to get Money out of Politics. An event hosted by the OWR- Milwaukee Chapter with Matt Rothschild of Wisconsin Democracy Campaign and Shauntay Nelson of Wisconsin Voices. Check out our livestream of the event HERE! 03/10, 03/16, 03/21, 03/24 – Our Wisconsin Revolution hosted multiple post-carding sessions with activists and members all over the state. We met up for coffee or a beer and put our hands to work writing over 800 postcards for OWR endorsed candidates. 03/21 – Fair Maps Presentation in Newbold, WI supported in part by OWR-Northwoods Chapter. 03/23 – The 11th AnnualWisconsin Grassroots Festival in Mazomanie, WI. Our Wisconsin Revolution tabled and engaged with grassroots activist all over the state. Good food, good company. What could be better? Our structure consists of these committees: Bylaws, Communications, Chapter Development, Elections & Advocacy, Events (Ad Hoc), Executive, Membership & Fundraising, Platform & Policy, Popular Education. Joining a committee is a great way to stay up to date on issues that you value and meet members from around the state. These committees would flourish with more member involvement. Please fill out this google form and join a committee! Is YOUR chapter doing anything we should know about? Send along news, events, and photos to Grace at grace@ourwisconsinrev.com so it can be included in the next newsletter.